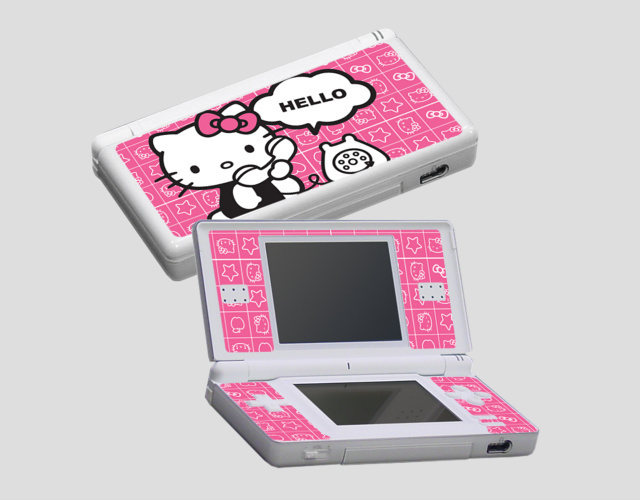 There’s nothing like the Nintendo DS (I have the “lite” version, not the funky 3D one- and I’d love to get the Hello Kitty skin, but I do have the full HK case, so why do that?) for geeks. You don’t have to be a geek to appreciate the DS, but I am a big fan of word games and various solitaires, and as far as hand-held games are, it’s probably the best one for that. I bought a DS so I would have something to occupy myself with when I was recovering from my hysterectomy. It was well worth it. The 3D version, which just came out last month, would be cool for action games- but I generally don’t play action games. The only action games I have are “Jackass” and “Sims”. I haven’t gotten past the first level on Jackass, and I haven’t played with the “Sims” game much yet. Most of the time I’m either playing Scrabble or Freecell (or Tuxedo or Sea Towers, on the Solitaire Overload package) or Bookworm, or the Crosswords DS game. This is gaming excitement for this old cougar. Gratuitous use of the DS also keeps me from throttling people when I am forced to wait. It’s that whole Type A personality mentality that doesn’t like to waste time- unless of course I’m occupying my mind with something else. Waiting in the Dr.’s office, or waiting for car repair, or anything else I have to wait on gets my nervous tizziness going on, and it doesn’t help that most public waiting areas subject you to either 1. bad pop music, 2. CNN or other depressing, extreme left-wing biased “news” broadcasts that insist Obama is the greatest President since Lincoln (gag), or 3. Oprah/Jerry Springer/Montel/Judge Whoever, etc., which is enough to make me want to hurl. If I’m playing a game I’m at least a bit distracted from being irritated and kept from excessive clock-watching. I do have Scrabble on my phone, but the DS version is a lot easier to maneuver. If I do have to watch one of those made for TV hokey small-claims court programs, why not bring back the People’s Court with Judge Wapner? Unless of course, Judge Wapner is dead. 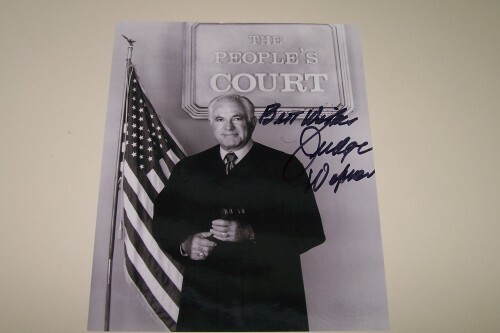 As of today, or the latest info I can find, Judge Wapner is still alive, but he’s 91, so he’s probably not much for making a comeback into the courtroom. I like to watch the exciting courtroom stuff like they show on TruTV, where the victim’s entire family beats the hell out of a murderer in the courtroom or something cool like that. I just can’t get riled up about some jackoff leaving skid marks in someone’s grass, or someone wanting reimbursed for her pain and suffering over a crappy hair do, and other petty stuff like that. If I’m going to be pissed off enough to take someone to court it better be worth my time and aggravation. I understand that 99% of the rest of the world is not wired like me at all, so I’m the one who has to adjust. I can’t expect the rest of the world to cater to my preferences, unless of course I can pay for that privilege. The ability to pay for solitude and to require others to come to me for necessary services could be a mixed blessing too. 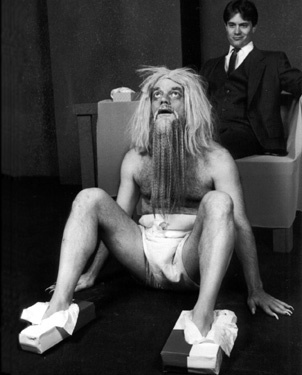 Howard Hughes was able to pay for the amount of isolation and catering he wanted, and look how he ended up- emaciated, naked, hooked on drugs and over all a pathetic mess. The reality is that many introverted people, if given enough money (and a bad enough case of OCD, which oddly, is one disorder common to introverted people that I have remained free of) could end up exactly like Howard Hughes. Whether I like it or not, I have to interact with other humans face to face. I am generally not paranoid about dirt or germs or weird stuff like that. I’m just not terribly social unless it is on my terms, and with the very few people that I actually enjoy socializing with. Most of the time I’d rather not talk to or interact with anyone, but there are things everyone has to do that they don’t always want to do. I like shoes too much to resort to wearing Kleenex boxes on my feet. I’ve noticed the older I get the more I get like my Grandma (Mom’s mother, who died back in 1990 at the somewhat untimely age of 74) and my Great-Grandma (her mother, who died in 1992 at the age of 94.) They were at least in appearances, classy old ladies. They both knew how to dress. When Grandma died she had over 500 pairs of shoes, all size 8 1/2 AAA. Mom wears the same bizarre size, so she inherited a nice collection. These weren’t cheap shoes either. They were all quality, good leather shoes- brands like Florsheim, Hush Puppies, Connie, Reebok, and her personal favorite, Naturalizer. I try to buy my shoes on clearance, because I am cheap, but I can’t abide cheap shoes. I will spend money on shoes, but I will go to the thrift store and the Target clearance rack to buy clothes. I buy along the same lines as Grandma did- well made leather shoes, only I need a 7B. I didn’t inherit Mom and Grandma’s narrow feet. Steve-o did though. Very few dudes wear a size 13A. His feet remind me of giant bird claws. Creepy. Anyway, Grandma was the type of person who spoke her mind even if it was politically incorrect or just downright embarrassing. I will never forget the time I took Grandma and Great-Grandma to K-Mart together. Neither of them ever learned to drive which I thought was a bit odd, but I didn’t mind taking them places. Grandma had worked as a lingerie buyer for a large department store for many years. When I was 13 (and already a 36C) Grandma warned me how important it was for me to wear a good quality support bra, otherwise I would be looking like the native women on National Geographic before I turned 30. Gravity has taken its toll (I’m 42 after all,) but the puppies would likely be a lot further south today had I gone braless like a lot of my friends used to do. 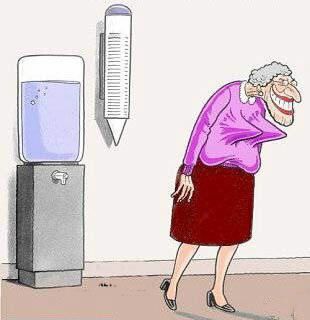 Grandma knew all the ins and outs of lingerie and fitting foundation garments. She also knew the good stuff from the cheap stuff. When we walked into K-Mart there was an absolutely horrible hot pink, red and black nightie type thing on the display mannequin. There were bright red hands stitched to the chest area of the nightie thing, as if some ethereal form were copping a feel of the mannequin’s puppies. Grandma simply had to comment. Then Great-Grandma (not to be out done) spotted one of the Behemoth Women Wearing Spandex which are unfortunately (pun intended) wide spread in the entire Central Ohio vicinity. There’s a reason why K-Mart sells size 20 women’s underwear, which could also double as a front end cover for Jerry’s Tacoma. Great-Grandma had to comment on her shocking sight of the day too. Both of them were laughing- loudly- all the way through the store, and I have to admit I was too, because their observations were spot-on. I think as people age the “traffic cop” function of the frontal lobe of the brain gets a bit tired out. We stop censoring everything and just say it like it is. In some ways I think that can be a good thing. I even see Mom doing this to some degree, which is shocking, because she has always been so straight laced and prudy. When we were kids she thought “fart” was a cuss word, and we weren’t allowed to say “fart.” We had to say, “passed gas,” “let a stinker,” or “went toot.” Now she is a hard-core road rager. She flips people off and calls them stupid assholes out the window, and worse. Maybe that’s why Grandma and Great-Grandma never drove. Mom’s a terrible driver. She has also been known to cuss out cops, which is not a very wise thing to do. If ever there were a time for the frontal lobe of one’s brain to engage, it’s when talking to a cop. I find the phrase, “Yes, sir, Officer,” to be a very appropriate one. “F*** off and die,” is not a cop-friendly phrase. Neither is, “Don’t you have better things to do than to torment old bitties?” I agree that sometimes cops do lie in wait for the occasional speeder, but the little old bitty doing 95 in a 25 (in a Ford LTD- granted it did have a 351 Windsor, but still,) is a hazard to the public. She’s lucky to have only gotten a speeding ticket and not a conviction for reckless op. That’s why Dad won’t let her have another V8. I’ve been in the car with Mom. I know how she drives. I side with the cop. I should get Mom this t-shirt. Maybe it will help if she’s wearing it the next time she gets busted.